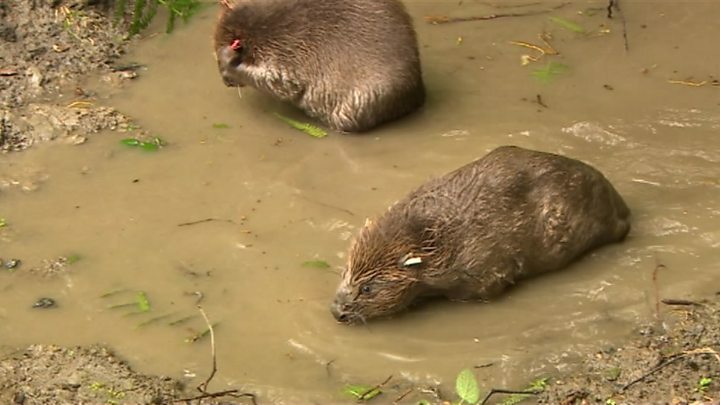 A pair of Eurasian beavers has been released into the Forest of Dean for the first time in about 400 years. The two adults were moved into a 6.5 hectare (16 acre) enclosure, near Lydbrook, to set up home on Tuesday. It is hoped they will provide a low-cost solution to flooding problems and reduce the risk of flash floods. Knowledge gained from the Forest of Dean trial will help to inform decisions on the status of the beaver in England in the future. Hydrologists from the University of Exeter are undertaking research into the impacts of beaver reintroduction at a number of sites in the UK, including the Forest of Dean. Their new home will be the Greathough Brook, a short, steep stream on the southern flanks of Ruardean hill which runs through a narrow wooded valley before entering the village of Lydbrook. It is hoped the beavers will help prevent flooding in the area by improving biodiversity and building dams and ponds. Forestry Commission forest management director for the west of England, Kevin Stannard, said it was "a momentous occasion". "We are looking forward to seeing the ecological and hydrological benefits the beavers will bring to the Greathough Brook," he added. Prof Richard Brazier, from the University of Exeter, said flooding in Greathough Brook contributed to flooding problems experienced in the village of Lydbrook. He said: "We now have a unique opportunity to study the impacts of beaver dams on the flood flows from this flashy and flood prone landscape."